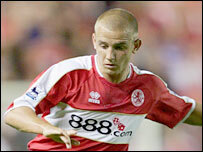 Midfielder Lee Cattermole has committed himself to Middlesbrough by signing a new contract. The 18-year-old's new four-year deal will keep him at the Riverside Stadium until 2010. Cattermole made a big impact last season after being given his league debut against Newcastle by former Boro boss, England coach Steve McClaren. Under new boss Gareth Southgate, Cattermole has featured in all but one of Boro's Premiership games this term. Boro boss Gareth Southgate has challenged Cattermole to justify his faith in him by becoming a top player. Southgate said: "We feel it's right to reward him with a new contract, he's earned that and now it's time for him to push on. "He has got a football intelligence and a mindset which is ahead of his years. He's certainly not fazed by anything, he has desire and rive and at times you forget how young he is because he is a man in a younger body. "It's up to him now, he has to continue the level of performance he has shown in recent weeks for us."